Nicotine is a naturally occurring potent alkaloid found in the nightshade family of plants known as Solanaceae. It is synthesized in the roots and then gets accumulated in the leaves of the plants e.g., Nicotiana rustica, Nicotiana tabacum, Duboisia hopwoodii and Asclepias syriaca etc. Nicotine had been extensively used as an insecticide in the past and currently as a neonicotinoids (imidacloprid). The prime sources of Nicotine exposure include tobacco use, Nicotine gum and Nicotine replacement therapies. Nicotine chemically is an amine and can easily breach the biological membranes as well as brain barriers. Nicotine is implicated in a diverse array of biological functions including gene expression, hormone secretion regulation and enzyme activities. Nicotine acts as a cholinergic nicotinic agonist involved in stimulating neurons and blocking neurotransmission. It acts as a central nervous system (CNS) stimulant drug (in low amounts) and owes its stimulating effects to various neurotransmitters, including acetylcholine, dopamine, beta-endorphin, serotonin, norepinephrine. However, higher amount of Nicotine is associated with harmful effects. Stimulation of the CNS may result in peripheral vasoconstriction, tachycardia (abnormally rapid heart rate), and increased blood pressure. The stimulant effect of Nicotine further contributes to addictive properties of tobacco smoking. Addiction is characterized by physical dependence and tolerance, mood and perception altering effects, compulsive use, relapse after abstinence. Nicotine also brings about stimulation of the chemoreceptor trigger zone which results in nausea and vomiting. Nicotine also has medical relevance due to its presence in tobacco smoke. Nicotine withdrawal is often associated with symptoms including irritability, sleep disturbances, intense desire, depression, anxiety, and increased appetite. The symptoms usually peak within the first few days after quitting smoking and then subside within a few weeks. In some cases, the symptoms persist for a longer duration of time including months. Nicotine withdrawal is attributed to behavioral factors as well as the pharmacological effects of Nicotine and can lead to severe withdrawal symptoms. Nicotine replacement therapies including gum, patches, and inhalers help to diminish the pharmacological aspects of withdrawal whereas behavioral therapies aid the smokers to employ strategies for prevention or evading these symptoms and urges. Nicotine is used as a medicine to help quitting smoking but may also pose few health problems at even recommended doses during Nicotine replacement therapies. Studies indicate the use of Nicotine to be associated with birth defects in fetus. The use of Nicotine during pregnancy may even pose a threat to child later in life for obesity, type 2 diabetes, hypertension, neurobehavioral defects, respiratory dysfunction, and infertility. In vitro studies advocate the association of Nicotine with cancer. Consumption of Nicotine at high concentrations may be lethal. Nicotine overdose is not likely the result of smoking alone but mainly attributed to the use of electronic cigarettes which may cause the person to take Nicotine at more than the recommended dose. 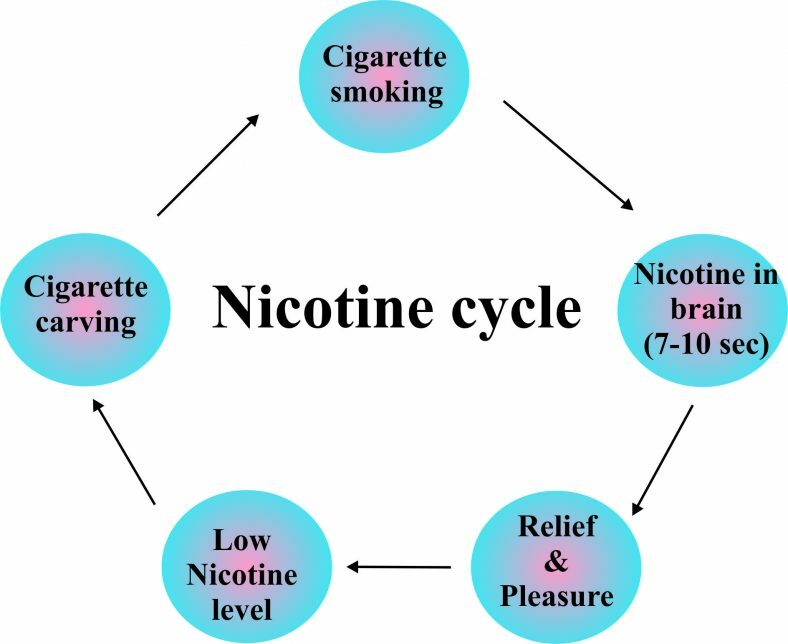 Nicotine acts as a stimulant drug in mammals that acts as an agonist and competitively binds at nicotinic acetylcholine receptors (ionotropic receptors consisting of five homomeric or heteromeric subunits) on dopaminergic neurons in cortico-limbic pathways. The resultant binding initiates conformation change in the receptor architecture and opening of the ionic channel. The channel then leads to conductance of cations such as those of sodium, calcium, and potassium. This leads to depolarization, activation of voltage-gated calcium channels and more influx of calcium in the axon terminal. Calcium causes a stimulation of vesicle trafficking towards the plasma membrane and dopamine release into the synapse. Dopamine binding to its receptors contributes to addictive properties of Nicotine. Nicotine also binds to nicotinic acetylcholine receptors present on the chromaffin cells in the adrenal medulla. Binding of Nicotine to the receptor opens the ion channel, causes influx of sodium and cell depolarization thereby activating voltage-gated calcium channels. Calcium then leads to release of epinephrine from intracellular vesicles into the bloodstream resulting in vasoconstriction, increased blood pressure, increased heart rate, and increased blood sugar. 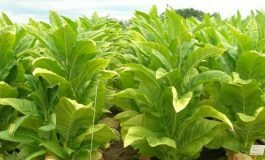 Nicotine is a naturally occurring plant product and belongs to the class of organic compounds known as alkaloids and derivatives and contains mostly basic nitrogen atoms. It also contains oxygen, sulfur and more rarely other elements including chlorine, bromine. Pure Nicotine is a colorless, hygroscopic, oily liquid, miscible with water below 60 ℃. The average molecular weight of Nicotine is 162.2316 Dalton. The melting point of Nicotine is -79 °C and boiling point 247 °C. Nicotine is likely to be volatile owing to its unstable nature and soluble in organic solvents. Nicotine turns brown and sticky in presence of light and air with odd smell and strong irritating odor. Nicotine has a pKa of 8.5. Nicotine easily penetrates the skin. As free base Nicotine burn at a temperature below its boiling point, most of the Nicotine is burned when a cigarette is smoked; but, enough amount is inhaled to provide the desired effects. The prime therapeutic use of Nicotine lies in the treatment of Nicotine dependence in order to eliminate smoking. Nicotine replacement therapy prescribes controlled levels of Nicotine to be prescribed to the patients in the form of gums, dermal patches, lozenges, electronic/substitute cigarettes or nasal sprays. Electronic cigarettes are licensed as medical products for weaning the patients off their dependence on Nicotine. Studies indicate the chance of success of quitting by 50 to 70% by the use of these therapies. Nicotine finds its implication as a performance-enhancing effector on cognition, alertness, and focus. Among the various nicotinic receptor subtypes, the α4β2 receptor is the subtype at which Nicotine exhibit highest binding affinity and also represents the biological target that mediates Nicotine’s addictive properties. Stimulation of the α4β2 nicotinic receptor is responsible for certain improvements in attentional performance. Nicotine is commonly used as a recreational drug owing to its stimulant effects. Recreational Nicotine products include chewing tobacco, cigarettes, cigars, e-cigarettes, snuff, and snus. Is Nicotine Addictive? For communication between nerve cells (neurons), brain uses certain substances or chemicals known as neurotransmitters. Neurotransmitters are produced by the brain and help to communicate signals and information between body and brain. Neurotransmitters can also affect mood, sleep, concentration, weight, and can cause adverse symptoms when they are out of balance. Neurotransmitter levels can be depleted by several ways such as stress, neurotoxins, poor diet, drugs abuse (prescription and recreational), genetic predisposition, caffeine and alcohol use etc. When Nicotine is consumed or inhaled it acts on nicotinic receptors and therefore keep them in highly activate condition. The excessive and chronic activation of nicotinic receptors is managed through masking or down regulation of active receptors. This results in suppression of psychotropic effect of Nicotine. Within the brain, Nicotine targets dopamine system that is involved in pleasure response. Nicotine directly triggers off abnormal and therefore induces euphoria. After smoking, the Nicotine ceases and the euphoria disappears. Consequently, more and more smoking attempt is required to recover the feel-good sensation. Hence, the need induces to smoke again. Nicotine can be absorbed through the oral cavity, lung, skin, urinary bladder and gastrointestinal tract. The process and rate of absorption of Nicotine through biological membranes is dependent on pH. At acidic pH (pH>7) Nicotine is ionized and therefore unable to pass through biological membranes, whereas at higher pH or basic pH (pH<7), Nicotine is charged and not ionized, therefore, easily pass through the membranes. At physiological pH (7.4) ~30% of Nicotine remain charged and therefore easily cross the membranes. Due to acidic pH of cigarette tobacco (~5.5), Nicotine is largely ionized (positively charged) and little absorbed via the buccal mucosa. Inhalation of Nicotine is therefore necessary to allow its absorption via large area of alveolar epithelium. Once reached inside the lungs, Nicotine is rapidly reached to the systemic circulation through lung capillaries. Following lung absorption, Nicotine is quickly distributed among all the body organs. As per the studies Nicotine takes ~10 seconds to reach the brain from the lungs. Besides lungs, Nicotine is also absorbed through skin which mostly occurs during tobacco harvesting (handling) and Nicotine replacement therapies. Inside urinary bladder, Nicotine is reabsorbed through mucosa of bladder. This process is pH dependent and reabsorption of the excreted urine occurs only when pH of urine is alkaline (between 8-9).The absorption of Nicotine through gastrointestinal tract is poor due to the acidic nature of this compartment. Studies with Nicotine have revealed a highly complicated pathway of metabolism, that primarily comprises cytochrome P-450 and FAD-containing monooxygenases. Following absorption, Nicotine is extensively metabolized in the liver and produces a variety of metabolites. The key metabolites of Nicotine metabolism are Nicotine N′-oxide and cotinine N′-oxide, which are produced as a result of mixed function oxidase system. Pathways of Nicotine metabolism are divided into the phases I and II metabolism. The phase I metabolism involves the microsomal oxidation of Nicotine whereas phase II metabolism involves N- and O glucuronidation of Nicotine and its metabolites. Before excretion, Nicotine undergoes extensive metabolization in the liver to form a wide variety of metabolites including Nicotine N-oxide and cotinine N-oxide. Excretion studies with Nicotine have revealed that it can be excreted through various ways such as urine, saliva, bile, feaces, sweat, gastric juice and breast fluid. It has been observed that about 55% (of total Nicotine consumed) of Nicotine is excreted through urine. Studies have revealed that excretion of Nicotine through urine is affected by ascorbic acid, which increases the urinary excretion of cotinine and Nicotine. Urinary excretion of Nicotine is also affected by the pH of urine. When pH is high or alkaline less Nicotine is excreted (due to reabsorption from urine), whereas at low pH or acidic condition high excretion of urine takes place (due to less reabsorption). Studies also revealed that rate of Nicotine excretion affects the rate of Nicotine consumption that means higher excretion demands more consumption of Nicotine. The duration of Nicotine stay in the body depends upon the amount and type of tobacco used. A reliable indicator of Nicotine use is cotinine that effectively detect the presence of Nicotine in the body. Several tests have been used to detect the presence of Nicotine and can reliably detect Nicotine as short as 2 days, or as long as 3 months. Nicotine testing is usually performed to detect use of tobacco products such as chewing tobacco, pipe tobacco, cigars, cigarettes and smokeless tobacco. Following consumption, Nicotine is metabolized into cotinine by lungs and liver and subsequently excreted into the urine. Cotinine is a very reliable marker for Nicotine test and easily detectable in urine, blood as well as in saliva. A number of tests are available for quantitative as well as qualitative detection of Nicotine from blood, urine, and saliva. Nicotine blood test: Nicotine blood test can detect presence or absence as well as level of Nicotine. For this purpose, cotinine and anabasine (metabolic derivatives of Nicotine) are used as biomarkers. Nicotine is metabolized into cotinine and anabasine, which are subsequently mixed into blood. Following metabolism, Nicotine is usually detected in blood from 1-3 days after last use of Nicotine products i.e. Nicotine patches or gum, cigarettes, smokeless tobacco etc. However, cotinine stays for longer period and its levels can be detected in blood from 1 to 10 days after last use. The levels of both Nicotine and cotinine in blood may vary depending upon the amount of Nicotine consumed as well as health and age of the person. Sometimes false positive results are also observed under certain circumstances such as thiocynate contamination. Therefore, results of Nicotine blood test may be false positive in person who are working at metal refining areas where high levels of thiocyanate are present, or under consumption of almonds, cabbage, mustards, and broccoli (contains thiocyanate) and intake of medications such as amphetamines. Nicotine urine test: The most common and readily available standard test for detecting Nicotine use is Nicotine urine test. The test detects presence of cotinine (Nicotine metabolites) in the urine, also used in blood tests. The test is as simple as urine sugar test and comprises a strip that is dipped for 5 minutes in urine to detect the presence of cotinine. The overall result is read as either positive or negative that shows presence or absence of cotinine in the sample. The test can easily detect the standard cutoff level of 200ng/ml of Nicotine in the urine. Cotinine level remains detectable in the urine for 3 to 4 days. However, in case of passive smokers, the level of cotinine can be detected as long as 15 to 20 days. Nicotine saliva test: Saliva test is the most recent, accurate and preferred method over the blood and urine tests, since it does not require tedious handling for urine or blood samples and provide accurate results with a superior sensitivity over urine test (0 to 2,000ng/ml of Nicotine). In this test, a strip is soaked in saliva for a period of 20 minutes. Following incubation saliva is reacted with cotinine to compare different levels of cotinine to estimate the amount of Nicotine exposure. Hair follicle Nicotine test: The hair follicle test offers the longest detection window in all available Nicotine tests and can detect Nicotine for months after smoking cessation as Nicotine makes its way from blood stream that nourishes the hair follicle. However, the test is rarely employed due to its expensive nature. Is there nicotine in e cigarettes? The answer is yes. 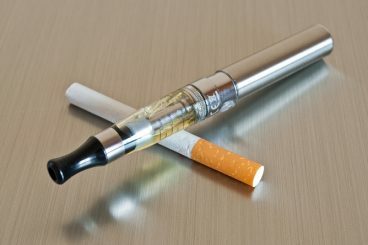 Nicotine test can also detect the use of E-Cigarettes. Since the tests are mainly rely on Nicotine and its metabolite and not on tobacco use. However, E-Cigarettes are delivered low amount of Nicotine then conventional cigarettes. Nicotine Test Uses: Following are some common uses of Nicotine tests. Businesses: Nicotine tests are frequently used for various business purposes such as by employers to test employees for Nicotine use, life insurance companies to determine premiums and detect fraud. Parents: Parents frequently use Nicotine tests to check their children for Nicotine use. Following consumption Nicotine can take 48-72h or more time to flush out completely from the system. It has been observed that Nicotine inhaled following cigarette smoking usually takes 6-8 hour to get rid from the body. It means it stay in the body and bloodstream and cause cravings till you feed with more Nicotine. Therefore, it is essential to completely filter out the Nicotine from the body to avoid Nicotine withdrawal symptoms effectively. The following are different ways that can be used to remove the Nicotine from the system effectively. Remove nicotine from body fast naturally. One of the most prevalent causes of Nicotine is the Cigarette smoking. The more you smoke the more Nicotine will be in your body. Therefore, it is advisable first to quit smoking and then switch to other ways that will help to filter Nicotine from your body. Next option is to drink lots of water so that hydrated body can easily remove or filter out all toxic materials including Nicotine. Eat green vegetables such as beans, eggplant, celery and cucumber. These vegetables help to increase removal of Nicotine from the body. Take lot of vitamin C and drink orange and carrot juice throughout the day. Besides this, infuse your diet with vitamins A, C, and E such as nettle, kiwi, pine needle tea, broccoli, oranges, strawberries, carrot etc. These vitamins help to improve immune system, metabolism and overall health. Deep breathing exercise improves circulation that infuse bloodstream with oxygen and enables the body to release toxins through sweat including Nicotine. Keep yourself away from coffee and alcohol since these substances usually triggers carving of Nicotine. To avoid smoking use oral substitute such as cinnamon stick, chewing gum or candy. Eat vegetables and food that can improve liver metabolism of toxins such as onions, garlic and egg yolks.